I’m 32 today, which is weird considering I barely remember turning 31. WHY IS TIME PASSING SO QUICKLY!? Like years past (and mostly because I lack creativity today), I thought I’d share some deep and meaningful life lessons from the 30s. Ha! 1. Flossing is way more important than we thought. I mean, I know out dentists literally crammed this truth down our throats all.our.lives. but the truth is, they’re actually right. 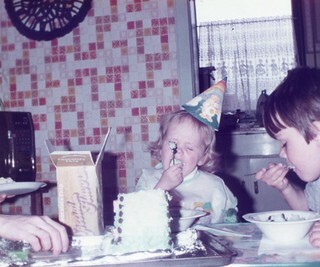 Before I hit 30 I had always been a noncommittal flosser. One or two times a week. Let’s not get crazy here! In fact, if we’re ever out together and you have a giant piece of broccoli in your teeth (hey, it happens) not only will I gently tell you, but I’ve got you covered on the floss. It’ll be in my purse. 2. Shaving my face changed my life. If you’re not doing it, start. 3. I’m completely comfortable having no idea who Meghan Trainor or Iggy Azalea are, or what the Kardashians are up to. I’m old. It’s ok. I’d rather do a better job keeping up with people I know in real life instead. 3. The world will not crumble if I don’t workout six days a week. 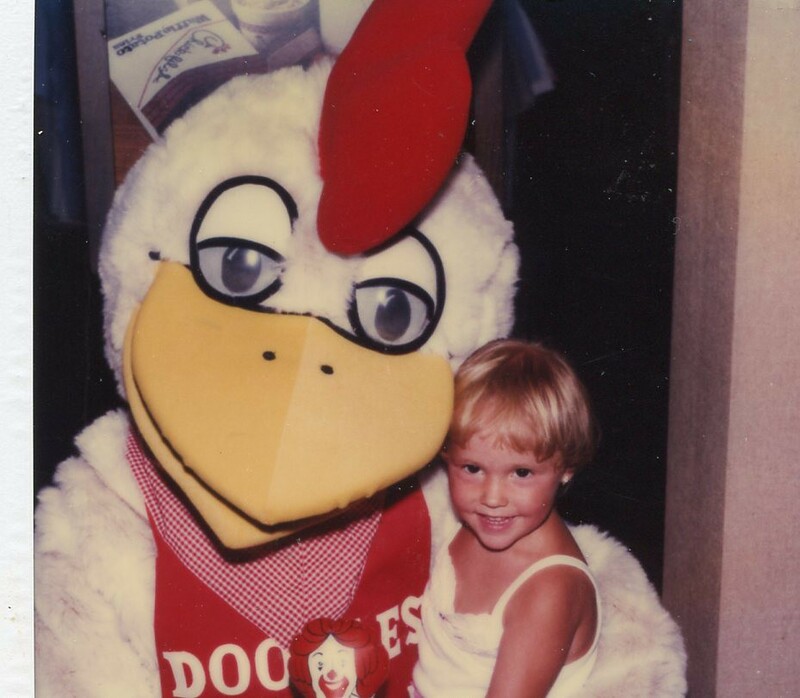 My affections used to be completely focused on health and fitness stuff. Six days a week, rigid eating, no treats. Don’t get me wrong, that stuff is still important to me, but I’ve found life is much more than push-ups and protein powder. 4. I’m completely fine admitting Will is my better half. Sure, we joke about it, and I tell him I’m the better half, but seriously- Will is the best part of Will and Brittny. I pray for Will daily, but multiple times throughout the week I’ll also just praise God for Will and wonder why He blessed a blonde ditzy mess like me with such a solid rock like Will. 5. I’m never going to be ok when it’s above 85 degrees. I’ve tried. Oh I’ve tried. I turn into a complete sweaty mess if I have to be outside for extended periods when it’s hot. I hate it, but it happens. I wish I could attend your outdoor wedding at noon this July, but I can’t. The focus should be on the bride. Not the weird 30- something chick that just passed out in a puddle of sweat in front of all your guests. 6. I’m still not entirely sure what I want to do with my life. I know, I know! I should have my life together and a little more figured out by now. The truth is, though, I just don’t. My five year plan is a little hazy these days. 7. I eat fish, and I’m going to keep eating fish. In fact, I need to update my “about me” section. I shared my post about struggling with my commitment to full blown veganism about a year ago. While I still follow a 90% vegetarian diet, I eat fish a couple times of week these days. 8. 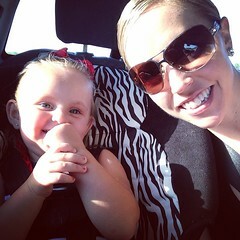 I’ve realized how much sweeter life is in the passenger seat. Believe me, I’ve driven my own life for a very long season, and it was miserable. Wrong turns, flat tires, and lots of car trouble. As I get older I find such peace in letting go and trusting Jesus. I never want to take the wheel again. 9. I love being at home. I hate to admit this, but over the years I think I’ve become a bit more of an introvert. Not with people I know, but more so with social media. I don’t take a bazillion trips to amazing places or eat the most Instagram-able foods. I honestly like being at home with Will and the dogs, or with my family or a few close friends. You may call me a curmudgeon, but I just call myself a little unadventurous most days. 10. I want to be braver. I’ve gotten better in my old age, but I’m still quite timid! I want 32 to be a year of stepping out and taking risks. So yeah. Lots of deep thoughts today (haha). I want to be present and enjoy 32. I want to step away from the phone and live in the moment. I want to eat pizza and not freak out, or let my house get a little dusty every now and then (um, you’re going to help me remember I just said that). I’m a big fan of winter soups. I like making a huge pot that lasts me all week. It also gives me the chance to get creative. If it’s a vegetable and in my fridge, it’s probably going into my soup. Today we’re making an easy standby I make each winter. 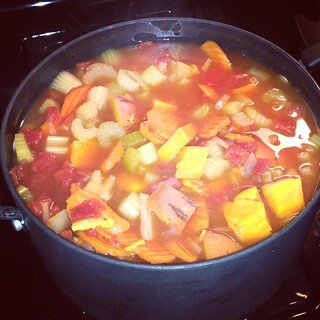 Sometimes other veggies get added or ratios change, but hey, that’s the beauty of soup. This was the perfect answer when feeling under the weather last weekend. Enough chatter. Let’s make soup! 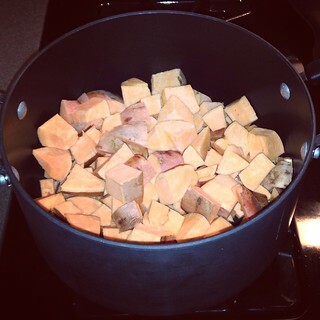 Toss 5 chopped sweet potatoes into a huge pot that’s over medium heat. 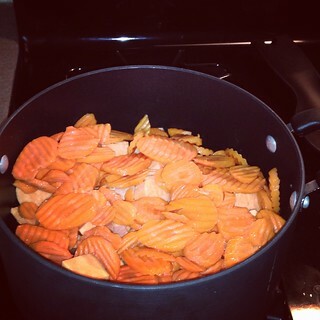 Add a bag of carrot chips. 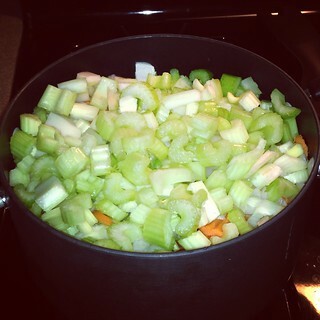 Throw in a small chopped onion, and include a few chopped celery sticks. As an aside, sometimes I’ll heat the celery and onion over a little oil to soften and flavor everything first and then add everything else, but today was all about speed! 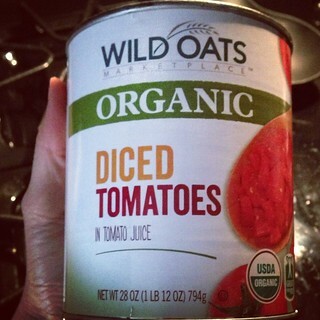 Now slowly add a giant (28 oz) can of chopped tomatoes and 32 oz of reduced sodium vegetable stock. Let everything come to a boil. Okay, now that things are heating up, let’s add some spices. Here’s the star of my soup. 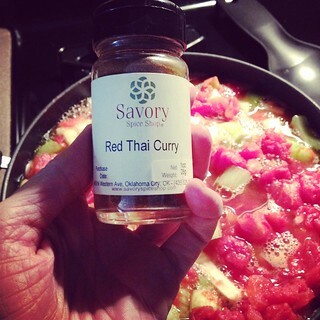 Red Thai Curry. It has such a wonderful flavor, and adds a beautiful color. Obviously regular curry works just fine too, and I also use a little of that in here as well! On top of the curry, I add a little ginger, a little parika, and salt. The soup is your empty canvas, season away! Clamp a lid on the pot, reduce heat, and let everything simmer for 30-40 minutes. When your timer goes off, add ladles of soup into your blender until it is about half full (if not, you’ll have a major splattery mess, I promise) and give it a good blitz until smooth. Repeat until you’ve got the desired consistency. I like my soup full of veggies, so I’m good with only one blitz. If you like yours more soupy, blend away! This is great with shrimp or tofu, however I didn’t add anything to today’s batch. This makes 8 generous helpings of soup, at about 130 calories each. I’m all about upfront prep that results in healthy lunches for a week! Here’s to a healthy Tuesday. One day closer to Christmas! I know we just experienced a holiday devoted to pies, fowl, mashed potatoes, and sweet potatoes encased in butter, brown sugar, and marshmallows, but I gotta talk about food today. Despite the Thanksgiving hiatus, I’ve made some changes to my diet over the last couple months and am compelled to share. Earlier this year, I switched from a completely vegan diet to one allowing for more vegetarian options. And oh man did that open up a whole new world for me. While I still prefer vegan, I’ve really enjoy the vegetarian protein options available. Prior to this switch, my diet was always heavy on carbs. While I was happy, my winter pants weren’t. I was also holding onto a lot of water weight. I love carbs and acknowledged their importance in a balanced diet, but that was the problem. Heck, with the job change my whole routine felt out of whack and unbalanced. Without living on pea protein, I really had a hard time naturally achieving a completely vegan higher protein diet without also upping my carbs. I could do it, but the truth is, I also missed B-12. I don’t need to tell you again. I posted all about it here. Anyway, making the switch felt so much better. Based on that change, I’ve recently made the decision to alter my diet a little more to be more protein focused. In fact, I’ve reduced my calorie intake by about 300 per day by adding back more protein to my diet. I’ve felt completely satiated and don’t even notice the deficit. Metabolic Effect, a site I personally have found to be a great resource, talks about how much our Hunger, Energy, and Cravings (HEC) play into hormones and how we eat. It’s not a one size fits all, that’s for sure. When I decided to lower my carbs and increase protein, it was really important to me that I kept my HEC in check (haha). That meant an incredibly slow process of reducing carbs and adding protein. I didn’t go on a crash diet of slashing all carbs and eating nothing but eggs and cheese. I cut by only a handful of grams per day to see how I felt. The good news was that I felt just fine. Satiated and satisfied. I still eat plenty of carbs, but I have definitely seen such a difference in my clothes by increasing my protein. I realize this increased protein concept seems like such a “duh” moment, especially for someone like me who has done lots of my own research on the subject. Yes, I fully acknowledge the importance of protein. I always have. Here are just a few examples of the swaps I’ve made. The biggest change came with my daily green monster. 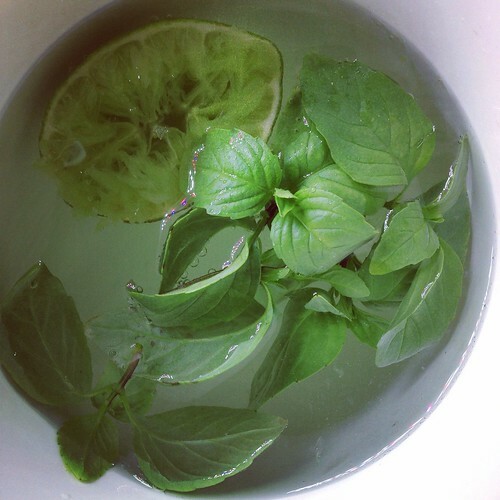 I LOVE my daily green monster, and I love it super fruity. Instead of my daily green monsters with a whole banana, I’ve ditched the fruit altogether or have added low glycemic berries instead. I also opted for a fruity greens powder to help add the flavor without the sugar. Hands down, that’s where I started saving the most carbs. Breakfast was second. Instead of oatmeal for breakfast, I’ve swapped for eggs with three cups of steamed greens (or something similar). Instead of lentils or quinoa for lunch, I’ve swapped for a salad with avocado and tofu. I’ve swapped air popped corn for organic yogurt, or my rice cakes for organic greek yogurt. This switch has been the hugest bang for my buck. We all know how much protein greek yogurt offers, and that was one was switch that catapulted my protein intake. I’m still occasionally adding in fish once or twice a week, which also sends my protein macros soaring. I share all this, but must also note, when I say “soaring” I really mean soaring the levels into a more balanced state. I was easily eating 45-50% of my calories in the form of carbs many days. Between the new job and the more hectic schedule, I stopped focusing on balance. 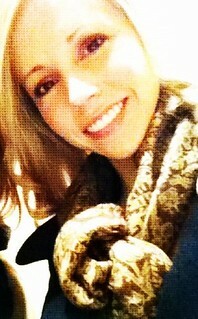 Fast forward eight months and I finally woke up and realized it was time to get ahold of myself. It started with my Fall Football Fitness goals and progressed from there. My HEC is in check (couldn’t resist), and my winter pants are happy girls. Thanks for tuning for this rather long ramble! Check in tomorrow! Today we’re talking Thanksgiving prep. I realize it’s over a week away, but hey, I say no time like the present to make a plan. You fail to plan, you plan to fail, yes? Like many of you, Thanksgiving lasts more than just a day at our house. It’s more like an entire weekend, really. Almost a season, if you will. I feel like everyone has their own approach to this time of year. Today isn’t about investigating what’s right or wrong. Today is all about sharing my own thoughts regarding Thanksgiving and my own personal plan of attack. My philosophy is to keep to schedule. If I scheduled an appointment with myself to workout Thursday, I workout Thursday. Obviously if it doesn’t look like a Thanksgiving workout is going to be feasible, I plan ahead and move that workout up in the week. However, for now I plan to workout at home Thursday. I’ll either do a workout video or one of the dozens of at-home friendly workouts I’ve created over the years. Friday-Sunday will be gym workouts. I’ll do both resistance and cardio work all three days. There’s a good chance all three cardio sessions will be a little longer than usual to help burn off some of that pecan pie. I love Thanksgiving Day food. I don’t even miss the turkey because I load my plate with everything else! I know people approach this entire meal in their own way, and so.do.I. I eat a normal breakfast that morning. Since I’m working out, I’ll drink my usual green monster followed by a high protein breakfast an hour or two later. When it comes to Thanksgiving, I eat what I want for that meal only. I usually fill up my plate half full of veggies, and the other half with tastes of other deliciousness like mashed potatoes, cranberry sauce, and various other yummy sides. Oh, and I always eat a roll, too. I drink water and eat what’s on my plate, enjoying the company of others all the while. After I finish what was my plate, if I’m still hungry or there’s something I wanted to try and didn’t, I will. That’s pretty much just as fantastic as the actual meal. I often make a small sampler plate of a few tastes of things I want and leave it at that. Do I eat more at that meal compared to usual meals? Am I so full that I want to die after? I try to make smart choices, but there are also things I enjoy that I don’t the rest of the year. Sooo that brings up the topic of leftovers. Will’s grandma loves to send us home with a big plate of leftovers. I usually only take small portions those items I can’t live without, and have round two later that night long after we are home. I don’t take more than one meal, and I don’t let them linger all weekend. If only Thanksgiving lasted one day. The bad news is that the pecan pie lives on. The B-Love family has two Thanksgivings! One with Will’s family, and one with mine. I do my family’s Thanksgiving much like with Will’s family. Only, I feel like I take more leftovers home. Th most exciting news of all is that this year we outsourced our Thanksgiving dinner to professionals! I am so so excited about it. It was dirt cheap and we picked the healthy menu option! Granted, we will add rolls and dessert, but hey, much better than the alternative. Plus it saves us all time in the kitchen and allows us to enjoy each other’s company! I can’t wait to tell you how it was. My workouts stay the same (with the exception of increased cardio ). My meals surrounding the Thanksgiving meal are pretty much the same as usual so I don’t overdo it and feel miserable after. I load up my plate with healthy options, but I also leave room for delicious treats. I eat dessert and don’t feel bad. I don’t overdo it on the leftovers. I love this time of year and look forward to next Thursday. I hope you do too! Here’s to smart choices leading up to the meal, and smart choices the day after onward. Alright girls, I’m getting personal today. I’m inviting you to take a peek at my recent blood test results. It doesn’t get much more personal than that! I had a health screening last week. Full disclosure- it’s been years, many years since I’ve done this. Maybe even before we moved back? I have no idea. As someone who claims to live a healthy lifestyle, I was embarrassingly overdue. Probably ought to do this more than once a decade, eh? Anyway, I was pretty pumped to see my results. I claim to be healthy, but it was encouraging to actually see cold, hard facts. I still have work to do (you’ll see my cholesterol is a little higher than I’d like it to be), but at least I have a baseline to compare against next year when I do this. Oh, and as an aside, can we please talk about the fact that Will and I got ours done on the same day? I say I’m not competitive, but I sure did want us to whip out our papers and compare. Will’s results were a little sobering, but not surprising. The good news is that the reality of seeing them in black and white motivated him to make a few healthy changes. So now let’s get to the nitty gritty. My results. The numbers in the first column are the “desirable” numbers, the middle is “borderline risk,” and the last is “elevated risk,” with my results written on the end. Here’s a rundown of some of the highlights, as well as some lovely personal commentary on how I think I can improve or stay strong. With the exception of total cholesterol, I was in the “desirable” range for every single element. I completely attribute that to exercise and my primarily vegetarian diet. I’m a firm believer both these elements were the reason I had such good results. Blood pressure was good, but Will can attest that can fluctuate on a given day. I’m a woman after all. 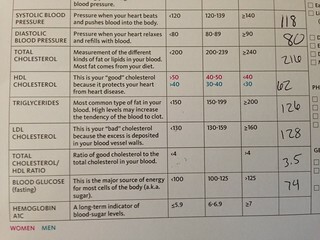 My “good” cholesterol was through the roof, and my bad was good too, however my overall composite cholesterol was 216, with the desirable range being below 200. I was kind of bummed to see it was a little higher than desired. I certainly don’t feel as though I’m at risk by these numbers by any stretch, however I do want to be a little more cognizant about the cholesterol I eat and where it’s coming from. I already do a pretty good job about it, however high cholesterol runs in the family and now that I’m old over 30, it’s time to keep an eye on it. I was surprised by my blood glucose and it answers why I have to eat before I workout these days. I used to be able to get up and hit it hard on a completely empty stomach, but over the last year I’ve had to have just a little something or I’ll feel faint. Ha, well there we go! As for other things, I was really disappointed in my body fat level. Having a desk job and literally sitting for close to ten hours a day really takes a toll on a body, and getting older hasn’t helped either. I was in the desirable range, but I really felt like it should be lower than it was. It is difficult to find ways to do more than I already do, so I may just have to find creative ways to get up during the day and move around a little more. So yeah. We just got pretty personal. You went to the doctor with me. There you have it, friends! Check in tomorrow for a goal review! Praise the Lord for the beautiful weather this weekend! I think it’s the only thing that salvaged our Saturday. We’ll get to that soon enough. Let’s start with Friday. Will and I had a fancy date to Taco Mayo (they have a salad I like) and the grocery store Friday night. I hadn’t been since the week before OU-Texas, so our cupboards were pretty bare! 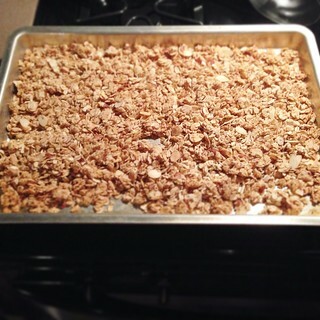 After our exciting night out, we came home and I made a batch of homemade granola. Between the vegetarianism, homemade laundry soap, and now granola making I’m pretty sure any day now Will expects me to start wearing socks with sandals and living on the land. Ha! Anyway, the granola? It’s killing me. Recipe to come soon. I hit the gym early Saturday. While I’ve worked out at home, I hadn’t stepped foot in the gym for 13 days! I’m pretty sure that’s my longest record. It felt good to be back, and my legs are suffering for it (in a good way). The game consumed most of Saturday. It was an 11:00 kickoff and close the whole time. That meant we, along with 90,000 others, stayed in our seats until the last few minutes. They break our hearts every time. As someone that has invested lots of time, money, donations, and trips to support them, it sure is a bummer when they stink it up. We usually take a shuttle back to our car, but we decided instead to enjoy the beautiful day and walk back. I was thankful we walked. Not only was the weather gorgeous but the exercise was nice too. Poor Will, he bleeds Crimson and lives for this time of year. He was super disappointed and frustrated by the loss. We walked with thousands of others, mostly in silence, and tried to enjoy the fresh air and quiet. Afterward, we seized the beautiful day by running a couple errands and washing the car. I also saw my mom and Layla, always a highlight. After church I hit the gym and did some cardio and upper body work. I also watched the Colts game with Will. I did my usual food prep, laundry, took a couple laps around the neighborhood, and even managed to sneak some time in with P and Layla and also chatted with a friend! All in all a good weekend, full of absolutely gorgeous weather. This is my short week, and I sure am thankful! My house desperately needs to be scoured. I suppose I’m getting a little ahead of myself, though. We haven’t even talked about the fun coming up this week! Here’s to a Monday that goes fast (😊). Check in tomorrow! We have a holiday weekend looming. Forget that it’s only Monday, let’s get excited! Okay, I realize it still feels forever away, but indulge me. Mine was different than most, but still good in its own right. I was a batchelorette this weekend! Will made a trip to Pennsylvania and back in one weekend. Just typing that makes me exhausted. Future disclosure to come fairly soon on why exactly Will was gone, but until then we can agree he had a whirlwind of a weekend! And I pretty much worried the whole time. Driving that long and far is very taxing on a person. He had a friend with him, so they slept in shifts, but if was still not exactly ideal. Anyway, with Will gone I was on my own this weekend. If I didn’t make a game plan, I had a terrible feeling I would wake up Sunday morning in a carb stupor and find myself covered in cereal boxes, magazines, and canned frosting. So I made a game plan. Will went in early Friday, so I skipped my morning workout to help him get out the door and see him off. The good news was that even though I skipped my usual workout, I was able to hit the gym Friday night to work back, biceps, and shoulders! I’m not a fan of working out at night. For me, if I don’t do it in the morning, I probably won’t do that all. However, with Will gone it gave me something to do and allowed me to “make good” on my usual Friday scheduled workout. I got home, did some laundry, showered, and ate homemade fried rice. Then I got to babysit! Layla and I had a great time. We played kitchen, did our hair, watched a show… I don’t know how you mamas do it. I taught her how to hop and then march with high knees and everything in hopes it would tire her out. Turns out I tired much faster than she. Ha! After she tuckered me out, I headed home with the pups. PS- I totally hate when Will is gone, especially at night. Saturday came early by choice. I hit the gym and worked legs crazy hard. 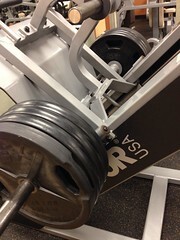 I’ve been going heavier lately and was pumped to bang out 5 reps of 360 on the leg press for the first time in months. I focused on light weights and high reps for so long, and it felt good to change it up again. I love this quote. Future blog post! Well, let’s just say nothing starts your morning like a post workout slap in the face with ice cold water. I did the ice bucket challenge. I wish I could share something witty, but all I can muster is- holy cow that water is cold! Here’s a link to part of the video. Here’s my after, sopping wet. 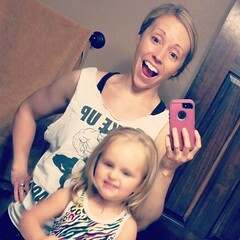 And yes, I’m wearing the same thing as I did when I babysat Layla haha. 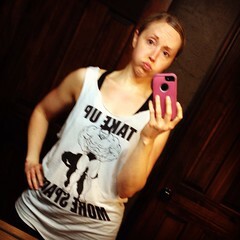 It was well into the evening when I babysat and if I’m going to get up early the next day to workout, I sleep in my gym clothes for one less thing to do and one more reason to get up! Anyway, Saturday morning we visited the Canadian County Fair in El Reno, Oklahoma! We went early, before it got hot, and saw lots of animals. I loved seeing them all. Plus seeing how friendly and playful most of them were reminds me why I enjoy animals so much and choose to follow a vegetarian friendly diet. Layla like most of them, but was afraid of the poultry and ponies! 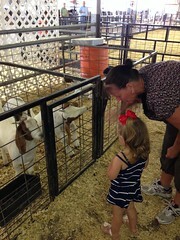 I thought for sure she would like the horses but she was scared. Maybe next year? The rest of the day was all about food prep and laundry. I even read part of a book, which I rarely do on weekends. Saturday night I went back to my parent’s for pizza and hanging out. I am so thankful for my family. I love them so much! I was bored out of my mind Saturday and am so thankful I have them so close and can spend time with them. With Will gone, I didn’t go to service on Sunday and instead watched online. I don’t know why I’m weird about not physically going since I was on my own, and I guess I should pray about it! I hit the gym and got a few things done, and by late morning my dear, exhausted husband was home! He looked like a complete train wreck. From Oklahoma to Pennsylvania and back in two days. Yeah, that will do it to you. I was so glad to have him home! I missed him so much. He slept most of the day, so we didn’t really hang out, but I was just glad to have him home. So now we start another week. A short week with a holiday on the horizon. Woo hoo! I get on kicks and eat things for weeks on end, get bored of it, start with something new, remember the precious thing, and then the cycle restarts. 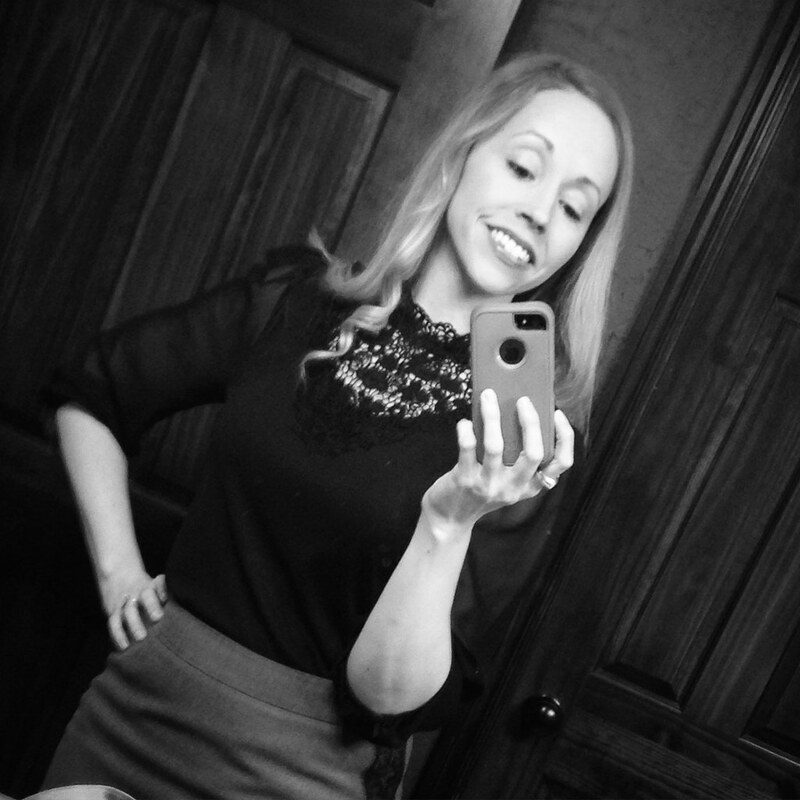 Today I wanted to share a few things that have tickled my fancy lately. Like the fact that Morningstar finally stepped up and created a veggie burger made with nonGMO soy. I was so excited to see these in the store, and am glad to know Morningstar listened to what so many vegetarians and vegans have been begging for. The burger is good, full of veggies, and doesn’t taste fake. A winner overall. I’m kind of anti juice. I mean, I like juice, but so much of it is full of sugar. Plus it’s liquid calories. Calories I can use for other things like whole fruit. 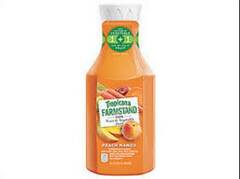 Anyway, when Will’s family visited last month I picked up this Tropicana Farmstand juice. I had some leftover and decided to swap out my almond milk for juice in my green monsters to use it up. Let’s just say it was the best worse decision ever. Let’s just leave it at being a good decision. It turned my green monsters into a delicious choco fruit smoothie (thanks also impart to my chocolate protein powder). I’m not going to make buying this stuff a habit, but I definitely see myself doing this as a treat again fairly soon. The 90s called and they want their food back. I had an insatiable craving for something crunchy and salty last week. All too often I succumb to digging through Will’s chip bag for the tiny pieces at the bottom just to kill the craving. As an aside, why are those tiny pieces so darn good!? Anyway, on a whim I tossed these guys I to my cart. 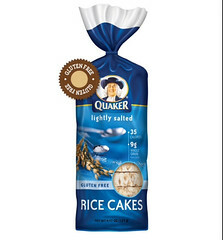 Like juice, I kind of feel like rice cakes are airy nothingness and empty calories. However, here’s the thing. Either I eat 150 calories worth of super processed greasy potato chips, or I eat two rice cakes for a total of 70 calories. If I mix together some PB2 as a topper, I still have a crunchy and salty snack for under 100 calories. I don’t know why, but I totally think of the 90s, Billy Blanks, and neon when I think of rice cakes. Nigella’s Beetroot Feta Pecan Salad. I’ve said it a hundred times before, and I’ll say it again. I have a total girl crush on Nigella. I don’t often make anything she cooks, but I find such soothing pleasure watching her cook. These stuffed poblanos are de.lic.ious. I made them for dinner last week and they were a hit. I substituted brown rice and even veganized my portion and omitted the sour cream and cheese, and they were still delicious. Yum. Guysssss. You have to talk me out of making whoopie pies this weekend. I used to make these sorts of things all the time years ago when I wasn’t into healthy eating. They’re super easy too. You use box cake mix and can frosting, and then sort of oomph it up a bit with your own ingredients. Anyway, I saw something on TV that made me think about them and now I.cant.stop. That’s 4 a piece, which is much more manageable. That’s all she wrote today. Anything I need to add to my cart?